Bayshore Towers is a low-density luxury condominium development located on the beautiful back bays of Orange Beach, Alabama. With its lush landscaping, beautiful grounds, and rooftop garden, Bayshore Towers condos feel like a world away, while being close to every amenity Orange Beach has to offer. Bayshore Towers was built in 2004 and contains only eighty-eight well-appointed units. This condo complex offers a perfect residence for boating enthusiasts and, among other amenities, boasts a large marina with plentiful boat slips. With its deep water access and proximity to Perdido Pass, Bayshore Towers provides a convenient and luxurious opportunity to enjoy the waterways of Orange Beach. Continue reading about the boater's paradise, Bayshore Towers, or click here to inquire directly and schedule a showing. In addition to its private marina and slips that can accommodate up to sixty-five foot long vessels, Bayshore Towers condos also include amenities such as covered parking, two large swimming pools, hot tub, tennis court, and gated entrance security. This complex is rent-restricted, which means that owners here enjoy a quiet, more residential atmosphere year round. Floor-to-ceiling windows and doors offer residents and their guests crystal clear views of the back bays of Orange Beach, and each unit has an oversized private balcony to enjoy the sunsets and natural coastal setting of Bayshore Towers. 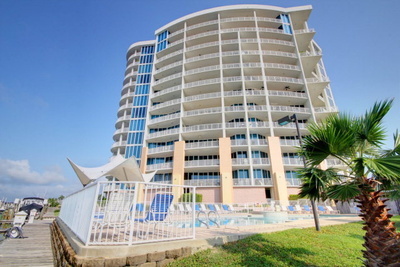 Bayshore Towers in Orange Beach is close to the Wharf, the entertainment and shopping district, and minutes from the gorgeous white sand beaches. Along Canal Road, you can also find some of the best restaurants in Orange Beach and enjoy the amenities at the Community Center. The Coastal Center for the Arts is also nearby, as are several waterfront parks and even the Orange Beach dog park. With its central location in Orange Beach and access to deep water, Bayshore Towers make an ideal choice for a boating aficionado, either as a second home or a year-round residence. Call today to schedule a private tour of this serene, rent-restricted community in Orange Beach.